Have questions about how to use interlibrary loan services? The answer to your question may be in our frequently asked questions below. Please feel free to contact your Interlibrary Loan office (link to contact page) if your questions are not answered here. How do I register with the interlibrary loan system? How do I get my materials and where do I return them? I am faculty, how do I request a film for my class? I am faculty, how do I arrange for my GA to request and pick-up my materials? I submitted a request, where is my confirmation email? How long do I get to keep ILL items? What does the ILLiad request status of my ILL mean? Why am I not receiving email updates on my ILL requests? What can I get through interlibrary loan? Can I use interlibrary loan to get a paper copy of an e-book? Are there penalties for overdue items? All USF students, staff, faculty and visiting scholars can register with the Interlibrary loan service at USF, by logging into ILLiad with their NetID and password via the log in buttons on the main ILL page ». ILLiad, is an automated interlibrary loan management system that improves our services to you by tracking your requests for materials your home library does not own. All first time users will be asked to complete a one time registration. You must specify a home library (i.e. Sarasota, Shimberg Health Science Library, St. Petersburg, or Tampa) when registering to use ILLiad. You may only select one home library. Some available library locations serve specific populations (ex. Shimberg Health Sciences library services Health students, staff, and faculty). Feel free to contact us if you are unsure which home library you should choose. Materials owned by the USF libraries may either be renewed in person at any of the USF libraries or via the online renewal service. *If two days have passed and you do not hear back from us on your renewal request, please call. Most articles are received by the ILL office electronically and delivered to you via your ILLiad account. Electronic article deliveries will be automatically deleted by the system in 30 days. Please check these materials for any problems and download a copy for your personal use as soon as they are delivered. Physical copies of articles are held at your Library Services Desk or mailed to you per your indication during ILLiad registration. Incoming loans (books) are held at your home campus Library Services Desk under your last name. A current picture ID card required to check-out ILL materials – no exceptions. Only the person whose name is on the ILL request may pick up an ILL book. Each library has the right to restrict the use of materials to “in-house use only”. This may be due in part to rarity, frailty or other extenuating circumstances. * Faculty who wish that their assistants or proxy card holder pick up their ILL material must make sure that the proxy holder’s name is also on the ILL request. Materials borrowed from another USF Library (i.e. St. Petersburg, Sarasota, de la Parte Institute (FMHI), Health Sciences Center and Tampa) may be returned to any USF library. Materials borrowed from non-USF institutions (identified by an informational band/label on the front cover) must be returned to the Library Services Desk of your home library. Do not use book drops – this includes book drops inside the building proper. Do not remove the band/label from the item you have borrowed. It is your responsibility to observe and adhere to these restrictions. Failure to do so may result in holds or penalties applied to your account. If you would like to request a film for delivery through PRONTO or from another USF library, please use the book/loan form in ILLiad. USF Tampa VHS and DVDs can also be scheduled for pick up for specific lecture dates via the Media Scheduling Services form. Media scheduling will also help you schedule a Media Center classroom in the library. If you would like for your GA to pick up your interlibrary loan materials requested by you, you can add their name after your last name in your ILLiad profile. Only persons whose names are in the account may pick up ILL materials. *The faculty member is responsible for all transactions, fines and fees of the proxy. Please let us know immediately if your proxy leaves your employ before your selected proxy expiration date. The ILL request management system, ILLiad, does not generate confirmation emails when you submit a request. However, your request should immediately show in your dashboard as an outstanding request. You can track it’s progress anytime by logging into your ILLiad account. The item is too new: ILL cannot process requests for books that have yet to be published and may have difficulty obtaining recently published items as we wait for other libraries to acquire and catalog them. Textbooks: ILL cannot obtain copies of textbooks used in courses at USF. Copies of items available in the library: if there is an available copy of the requested material available in the library, your request may be cancelled with information on how to obtain that material. Media: we will try to obtain DVD, VHS, CDs, etc., however, many libraries do not loan their media. This can cause delays in the processing of your request and may result in a cancellation if a lending library cannot be found. We have exhausted all avenues: we have found no library willing to lend the material, no acceptable options for obtaining the material outside of our library contacts and no proof that the citation was incorrect and the request could be filled with a differently cited item. If you have more information on a request that could help us, we will always try again. Most articles are delivered electronically and can be available in your ILLiad account in 2-10 days. Books and other loans from non-USF institutions are typically available in approximately 1-2 weeks. Your request is processed within 24-hours of receipt – the delay is incurred while awaiting action by the lending library, over which we have no control. Loan periods vary and are assigned by the lending institution. Additionally, materials are subject to recall by the lender at any time. Overdue fines on materials borrowed from non-USF institutions are particularly steep (see below). It is your responsibility to be aware of your material’s due dates. During the course of processing your interlibrary Loan request will move through several different status levels in the ILLiad system. You will receive an automated email notification when your item is available but the status levels will also give you an idea of how your request is doing. Awaiting Request Processing: Your request has been successfully received by the ILLiad system and is waiting for an ILL staff member to process it. Request Sent: Your request has been sent out by ILL staff to potential lenders. It will remain at this status until a lender agrees to send us material and that material is received by the ILL office. ILL Purchase Requested: Your request has been selected for our Purchase On Demand program. Instead of processing your request for a loan of the material, our library is purchasing the material. The entire purchase process should take no longer than receiving a loan from another institution. Awaiting Information From Customer: ILL staff need your input in order to finish your request. You should have received an email notifying you of the problem. Customer Notified via Email: Your requested material has arrived and is being held for you at the Library Services Desk. You should have received an email notifying you of the delivery. Checked Out to Customer: Your requested material has been picked-up at your Library Services Desk and is in your possession. Why am I not receiving email updates on my ILL request? The ILLiad system does not send confirmation emails. Instead, you can check the status of your request by logging into your ILLiad account. If you are not receiving cancellation, availability, renewal, or request for information emails there are a few things that could be happening. Please check your ILLiad account under “change user information” to verify that we have your correct contact email. ILLiad emails can also be caught by spam and junk filters. Please make sure that emails from our system are marked as safe. Interlibrary loan services are available to all current USF students, faculty and staff. Please contact your ILL office (link here) for more information on your home library’s policies and procedures. Distanced Learners can have interlibrary loan materials delivered to their home address. For interlibrary loan purposes, the library defines a USF distance learner as a student currently enrolled in distance coursework who attends on-campus less than once a week and has a permanent residence outside Hillsborough County. Distance learner patrons must agree to return loans so that they are received back at the USF ILL office by the due date issued by the lending library. Mail delivery of non USF materials will be restricted to the United States. Patrons are responsible for all return postage for loans. Visiting Scholars (i.e., persons engaged as professors, research scholars or specialists in the USF J-1 program can make use of interlibrary loan privileges by working with their faculty sponsor to fill out the Visiting Scholar interlibrary loan form and establish a patron account by return the form to the interlibrary loan department. ILL works with libraries across the nation and beyond to get you access to materials that USF Tampa library does not own. This material is subject to the usage rules and due dates set by the lending library. 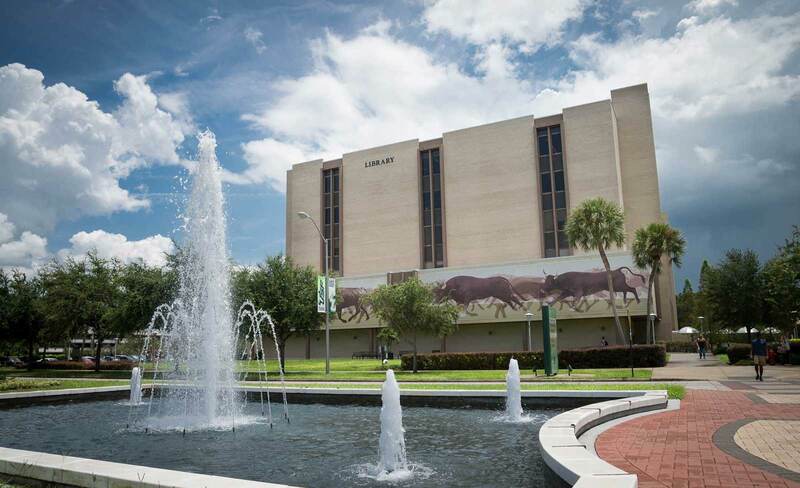 ILL will transfer materials owned at other USF Libraries to the Tampa Library. ILL will also process requests for items currently checked out/unavailable at the Tampa Library. Interlibrary loan cannot usually obtain alternative format copies of books that the library owns. There are a couple of exceptions: if there is something wrong with access to the material, or if the material exists in a different format at another USF library. The Tampa ILL office can process 20 ILL requests per person per week. Requests in excess of this will be held until the following week. However, ILL can only hold one week’s worth of requests. Please remember that book loan periods are limited to the due date set by the lending library and often cannot be renewed; schedule your research accordingly. Materials owned by the USF Library System are subject to overdue fines at a rate of .25 per book per day with an additional $10 service charge on the 10th day. Charges for lost materials will be decided by the lending library. You will receive two (2) or more emails reminding you of your due date. At ten (10) days overdue, you are blocked from using ILLiad and you incur an additional $10 charge. Thirty (30) days overdue: you are billed for the items replacement cost as determined by the lending library. All replacement costs are non-refundable. Repeat offenders: interlibrary loan service will be blocked to individuals whose borrowing privileges have been suspended twice or who chronically return interlibrary loan materials after the date due. Patrons who have been blocked may request reinstatement of privileges by petitioning their home library. In addition, according to the USF Student Code of Conduct, misuse or abuse of ILL privileges may result in adjudication by the Student Judicial Office. See Student Code of Conduct: Section I(5): Response to Notice and Section I(7): misuse of property.